Mustique is a favorite hideaway for stars seeking privacy and peace of mind. The tiny island is not easily accessible without a private plane or yacht. Lodgings are limited to one hotel, one guest house and a collection of luxury villas. Before The Cotton House – Mustique’s only hotel – opened for business, the only lodgings available for visitors on the island were spectacular villas and a small guest house or two. The exclusive nature of the existing accommodations meant that only a select handful of affluent and island-savvy visitors could gain access to Mustique. The name Mustique has gained considerable cachet in the media as the destination point of private planes carrying the likes of Mick Jagger, Jerry Hall, David Bowie, Princess Margaret, Lord Lichfield and Viscount David Linley. While these are a few of the notables who actually own property on Mustique, famous non-homeowner visitors (King and Queen of Greece, Kate Moss, Claudia Schiffer, David Copperfield, Phil Collins, David Byrne, Calvin Klein, David Geffen, and Joanna Whatley-Kilmer) are also responsible for boosting the island’s prestige and glamour quota by gracing Mustique with their presence. Initially, Mustique was a secret getaway oasis and only friends and associates of the stars were privy to its charms. Those charms have not been endangered by the invasive expansion and unwelcome construction that fueled tourism industrieMustique Island: Grenadine Islands: romantic Mustique vacationss on other islands. 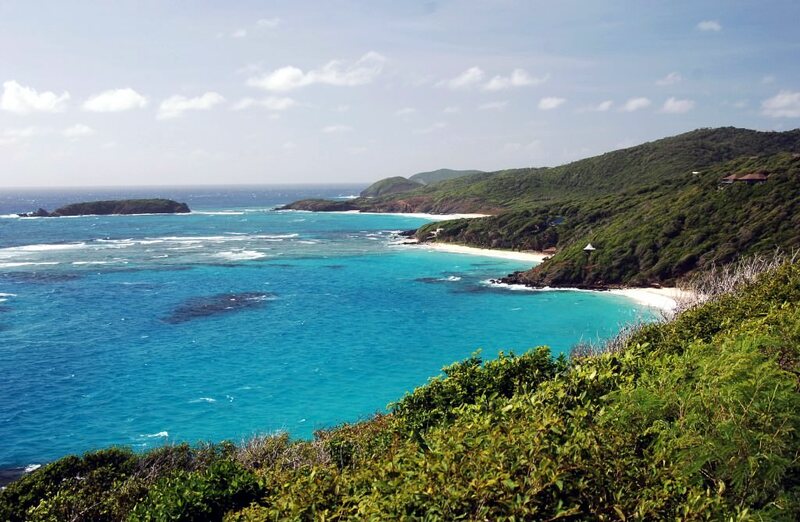 Mustique’s concerned inhabitants, which include both the well-known and the unknown, have instigated strict laws to protect the island’s land, water and air. Mustique’s tradition as a vacation spot for reclusive jet-setters began when it was purchased from the British Commonwealth in 1958 by Scotsman Colin Tennant (Lord Glenconnor), who developed the island’s 1,400 acres of dense scrub into a self-sufficient community built on fishing, cotton and agriculture. The Honourable Colin Tennant was attracted to the island’s history. As one of the Grenadines (so-named for their evolution from a volcanic eruption on Grenada), which Spanish sailors first sighted in the 15th century and named Los Pajaros (the birds), the island was populated in turn by Arawaks, then the Carib Indians. But the native tribes were quickly decimated with the arrival of European planters in 1740, who came to cash in on the sugar boom. Three forts still exist on Mustique, at Liverpool, Shandy and Percival, where the English fought off invading French troops. When the sugar trade moved north in the early 1800s, plantations were abandoned and Mustique returned to its native state – minus the natives. Wild cattle and sheep were the primary tenants; the seven sugar plantations had become an overgrown jungle. Today the sugar mill and its “Cotton House” remain on the old Endeavour Plantation site. Tennant’s purchase created an economy for the nearly 100 people living in the village of Cheltenham; they worked fields of cotton, peas and corn. An improved economy created the village of Lovell and by 1968 a cotton plantation flourished and a fishing industry gave islanders a means of self-support. Mustique’s first prominent celebrity was Britain’s Princess Margaret, who accepted 10 acres of Mustique land as a wedding present in 1960 from Tennant. At that time there had been few visitors to the island, other than yachts, including the Royal Britannia, enjoying the ideal sailing conditions. In 1968 Tennant formed The Mustique Company, which owns and acts as custodian of the island, and entered into agreements with St. Vincent to open the island to visitors under strict provisions that the land be maintained and not exploited. While the building of private homes was approved, the number could not exceed 140. In 1969, the sole hotel, The Cotton House, and the tiny airport opened. Both the hotel and the villas bear the signature style of the late theatrical designer Oliver Messel, who later collaborated with architect Arne Hasselquist. Mustique’s reputation as a party place for the jet set was enhanced by Princess Margaret’s parties at her villa, Les Jolies Eaux. Her rich and famous guests discovered that the unspoiled, beautiful island was a safe haven where they didn’t even have to lock their doors, and there were no autograph-seekers or paparazzi. Tennant sold The Mustique Company to a consortium in 1976, and in 1988 it was purchased by 55 Mustique homeowners, several of whom are among the island’s famous residents. The new Mustique Company remains dedicated to limiting development and protecting the environment to ensure the kind of privacy that makes the island such a sought-after getaway.